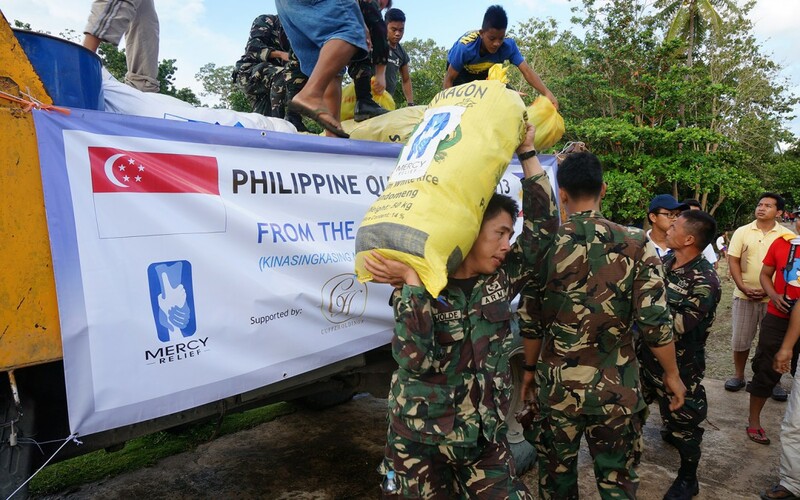 Singapore’s humanitarian NGO, Mercy Relief (MR) landed into the Visayas on Wednesday, two days before super Typhoon Haiyan made landfall onto the Philippines. Working closely with local partners, together with Bohol’s government and Department of Social Welfare and Development (DSWD), MR’s response team continued its ongoing relief efforts for the quake-stricken survivors and provided support to the vulnerable communities battered by the strong winds and heavy rainfalls brought by Typhoon Haiyan. On Saturday, the team personally distributed its fourth tranche of aid which included food packs comprising rice, preserved seafood and cooking oil to around 2,000 people living in four evacuation centres of Calape municipality in Bohol. Displaced quake survivors in the province struggle with recovery as power supply, water generators and communications were disrupted by the lashes of Typhoon Haiyan which has affected around four million communities across the Philippine’s Visayas. Super Typhoon Haiyan, one of the strongest tropical cyclones recorded, made landfall onto the Philippines on 8th November 2013, bringing sustained winds of more than 300 kilometres per hour. Communities in eastern Visayas suffered direct hits, with death toll expected to reach 10,000 in Leyte’s capital city of Tacloban. As of 11th Nov 2013, MR’s assistance worth over SGD55,000 has served around 1,400 affected families across the quake-stricken areas of Antequerra, Loon, Sagbayan, Cortes and Calape, through the donations from Cuffz Holdings, Cargill and Rahmatan Lil Alamin. MR worked closely alongside the local authorities and partners to provide aid to the quake-stricken communities who also suffered the brunt of Typhoon Haiyuan in Calape municipality of Bohol province. Critical aid such as food, water and shelter are in urgent need for these vulnerable and crises-stricken communities.